The Ukrainian Soviet Socialist Republic or in short, the Ukrainian SSR or Soviet Ukraine was in the southwestern part of the Soviet Union. 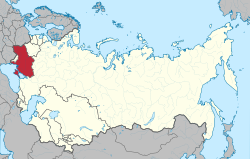 It had the second largest population of the fifteen republics of the Soviet Union. This lasted from 1922 to 1991. The Ukrainian SSR was a founding member of the United Nations. It did not really have much power because it was tightly controlled by Moscow authorities. When the Soviet Union broke apart, the Ukrainian SSR became Ukraine. During its 72-year history, the republic's borders changed many times. The eastern city of Kharkiv was the republic's first capital. However, in 1934, it was moved to the city of Kiev. Kiev is still the capital of Ukraine. ↑ Soviet Encyclopedia of the History of Ukraine (in Ukrainian). Academy of Sciences of the Ukrainian SSR. 1969–1972. ↑ Law of Ukraine "About languages of the Ukrainian SSR"
↑ "Activities of the Member States - Ukraine". United Nations. Retrieved 2011-01-17.